4-hour excursion on the catamaran from Fuerteventura to the neighbouring island of Lobos including sandwich snack and drinks as well as the opportunity for water sports during the anchorage break. You circumnavigate the island in a catamaran. In good weather you will be transferred to the island in a dinghy and have a short stay there. Afterwards you will be taken by catamaran back to the starting point: this is Corralejo in northern Fuerteventura. Would you like to give yourself or your family and friends an unforgettable experience with the catamaran tour in Corralejo on Fuerteventura in the north of the island? That's possible here. In the mornings or afternoons you start with the catamaran in Corralejo and explore the wonderful coast on the boat. Only a few trains at sea are required to reach the beautiful Isla de Lobos. The island and with it the highest mountain can be seen well from Fuerteventura. Lobos is a nature reserve and is regarded by many as an oasis of peace. The water all around has particularly beautiful colours and is guaranteed to make you dream a little of the Caribbean. Your catamaran tour takes you around the island. The boat anchors in a bay and you can take the opportunity to sunbathe or swim. Besides snacks and drinks, the equipment for various water sports activities is included on this 4-hour catamaran tour to Lobos. You can go snorkelling and explore the underwater world or grab the kayak and explore the island's coast on your own. A standing paddle is also on board this modern catamaran, which has a toilet and comfort on deck. In the lounger nets you can relax and dream while the ship swings in the water. The crew will take care of your physical well-being on this half-day excursion. Sandwiches and fruits are served as well as a little refreshment and a glass of cava. If the weather conditions allow, take the dinghy to Lobos. Then you not only have to look at the beautiful island from the water, but you can also enter and explore a little. After this expedition, it is time to drop anchor and return to Corralejo by catamaran. The holiday resort in northern Fuerteventura is both a starting point and a destination. This catamaran tour on Fuerteventura gives you the feeling of freedom in nature. Leave everyday life ashore and enjoy over 4 hours of Fuerteventura from the seaside. A wonderful excursion to enjoy the nearby island. I was great! Crystal clear water, beautiful views, price and quality of service to recommend. Una maravillosa excursión para poder disfrutar del islote vecino. Lo pase genial! Aguas cristalinas, bonitas vistas, precio y calidad de servicio para recomendar. Ramon y Nacho crew, pattern, equipment, boat and day overall ... everything has been excellent. La tripulación Ramón y Nacho, el patrón, el equipo, el barco y el día en general...todo ha sido inmejorable. My girlfriend and I booked the tour online. Tickets came immediately with a map of the departure point. Thank you for the service! Otherwise, the Tour was very nice, we liked it very good except for the food. But you do not because of the food here. :-) Share the tour in any case! Meine Freundin und ich haben die Tour online gebucht. 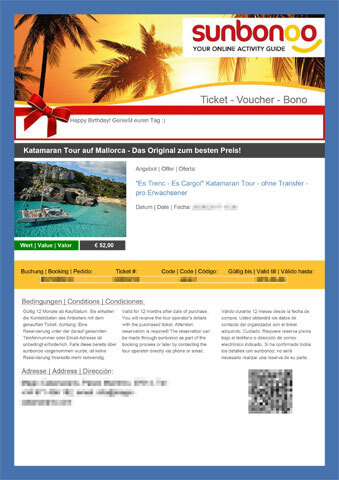 Tickets kamen sofort mit einer Map für den Abfahrtspunkt. Danke für den Service! Ansonsten war die Tour sehr schön, uns hat es bis auf das Essen sehr gut gefallen. Aber man kommt ja auch nicht wegen des Essen her. :-) Empfehlen die Tour in jedem FAll! Again any time. Had a dream day at sea. Skipper very nice, food ok. We were lucky to have very many nice people were aboard. Jederzeit gerne wieder. Hatten einen Traumtag auf dem Meer. Skipper sehr nett, Essen ok. Wir hatten Glück, dass sehr viele nette Leute an Bord waren. You're reviewing: Catamaran tour in Fuerteventura, Corralejo (north) to the island Lobos. How do you rate this product?